Tucson, AZ, WPH Press, 8/25/15- Junior WPH was proud to present the Tuesday Night Showdown and Junior Skills Competition, as Costa Rica’s 12th ranked R48 Pro Jonathan Iglesias challenged Tucson’s 16th ranked R48 Pro Abraham Montijo. Before the showdown match, Fred Lewis Foundation junior team members participated in exciting target hitting competitions for WPH prizes. WPH Coach Jonathan Iglesias gave more than a dozen Fred Lewis Foundation junior team members fly kill, corner kill and serve coaching, with the juniors then competing in three target-hitting skills competitions. The winner of each competition claimed a WPH prize. 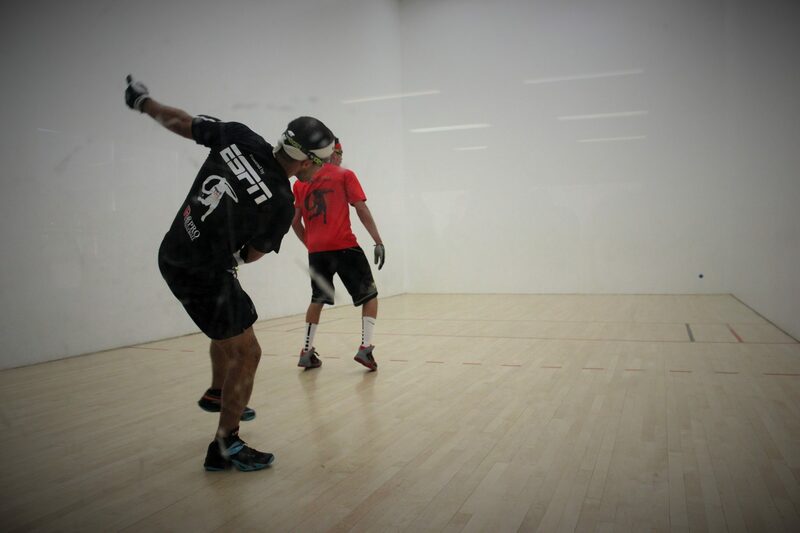 Jonathan Iglesias arrived in Tucson after spending the last week competing in the World Handball Championships in Calgary, where he was defeated in two competitive games by former R48 #1 Charly Shanks in a round of 16 clash. Abraham Montijo was aiming to defend his home court at the Tucson Racquet Club just two weeks after dropping a tiebreaker to 2015 WPH R48 Rookie of the Year Daniel Cordova at the Junior WPH Battle of the Border. The pros dazzled a partisan Montijo gallery throughout the showdown, with both hitting the deck on multiple occasions to extend rallies. With the average rally at 18 shots, both Iglesias and Montijo were exhausted midway through game one. Iglesias led 10-4 before Montijo started to surge, cutting Iglesias’ deficit to 13-10. Fighting visible fatigue, Iglesias closed out game one, 15-13 with one of his patented paddle-fly kills to take a one-game lead. Catching his second wind in game two, Iglesias raced to a 10-1 lead in just six minutes. A Montijjo timeout did little to stop Iglesias’ momentum, as he arrived at match point, 14-3. Seemingly just a formality, Montijo started to put kill shots together, scoring seven straight points in one inning to make what appeared to be a forgone conclusion into an interesting match. Iglesias took his final timeout at 14-10, but a quick side out and four straight Montijo points tied the score at 14, an impossibility just 20 minutes prior. Montijo continued his hot streak, scoring the final two points of the game to make one of the largest comebacks in recent memory and force a tiebreaker. “You can’t watch this kind of handball anywhere in the country,” boasted Doug Clark in what has become his trademark line at all WPH Showdown matches. Iglesias stopped Montijo’s scoring streak at 14 points by tying the tiebreaker at one. Iglesias would grab a 5-1 lead and appear to be on the verge on running away with game three, but Montijo fought back, tying the score at five. The pair were tied at seven, nine, and 11 before Montijo finally seized control of the nearly two-hour battle. Relying on his serve and inside-out right corner kill, Montijo scored the final four points of the match to clinch the Tuesday Night Showdown, 13-15, 16-14, 15-11. The Tuesday Night Showdown and Junior Skills Competition was the second special Junior WPH event this month in Tucson, with Junior WPH hosting the Battle of the Border & Calcutta Doubles earlier in August. Thank you to WPH board members Doug Clark, Scott Cleveland, Vince San Angelo, Jeff Healam and the local Tucson handball community for their support of a great event.